Often compared to gremlins, if you ask me i don't know why other than little creatures. Critters are far more deadly yes they are slapstick both but Critters are aliens too, (yes i know canonically gremlins are too). This is one of my favorite little creature features though and ranks up there with some of the best comedy horrors of the 80's too. So somewhere deep in space the last two Critter creatures are destined to be transported elsewhere. The little creatures manage to overpower the guards and steal their ship then fly off. Two Bounty hunters are hired to chase them and hunt them down. Critters like to eat and when they eat they reproduce like mad. They crash land on earth and two people mistake their craft for a meteorite. Brad and Jay go and check out the crash site. They disturb the critters while they are eating a cow and the little guys run off. The Critters themselves are an odd little thing its head is mostly mouth with two little piercing red eyes, a little fat body with stumpy legs and arms. They are covered head to toe in fur and sharp little quills. So the later jump a police officer and devour him, Seeing the farm as a large food source they decide to besiege it. When Jay goes to check on why the electricity has been cut he is attacked and stung by one of the Critters quills. These are designed to incapacitate larger targets for the little guys making them easier to deal with and eat. April is the barn with her boyfriend trying to get it on when the Critters show up and kill him. Brad actually gets to kill one of the Critters by making it eat a cherry bomb, quite amusing there. The bounty hunters in this are not to great they are in fact a little inept think along the lines of the other hunters in suburban commando lol. The Critters are returning to their ship a little later when the actual bounty hunters finally show up. The Critters who we learn a little later on now are called Crites, have also taken April with them. Unknown to them Brad and Charlie have gotten April off the ship. The Critters destroy the family farm house just being dicks. Brad managed to throw a Molotov cocktail onto the ship which ignites the fuel supply and ends up blowing their ship out of the sky. I won't give away much more even though there's not much more left but there's some major spoilers in the last few minutes of this film that are worth keeping sch-tum on, at least until i review part 2! 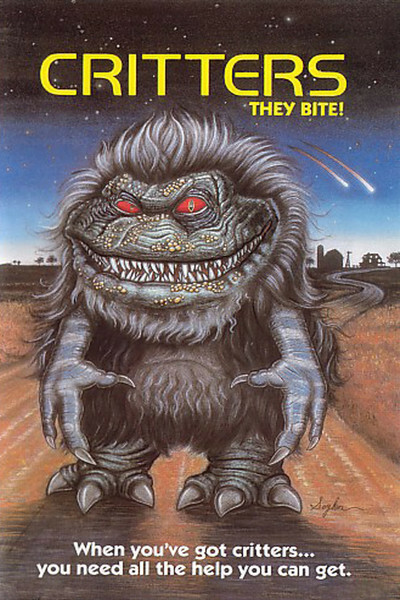 THN really enjoys the Critters films, much more than we should i suspect but everyone has a gushing film right? So Critters 1 gets a respectable 4/5 stars from THN.